75,000 hotel rooms to choose from. Beaux rěves! For some, a hotel is simply a base at which to sleep and scrub up before stepping out again to explore the city. For others, it��s a feature of the holiday worth savouring in its own right. Whatever your take, there��s a Paris hotel that fits the bill. We��ve selected the best of the bunch in every category, starting with marble-clad palaces fit for a Sun King, and moving down the price slope to the cramped-yet-cosy hotels with exposed wooden beams and vaulted, bare-stone breakfast rooms, via sleek boutique hotels with their flat-screen TVs and daring colour schemes. And, of course, we��ve got a pick of budget addresses where there��s no need to stay any longer than it takes to get some shut-eye and a shower. Hotels are graded according to an official star rating system designed to sort palace from pit stop - but we haven��t followed it in this guide. Said star ratings usually reflect room size and mere presence of a lift (rather than decor, staff or atmosphere), and we don��t think the system is of much practical value when making your choice. Instead, we��ve divided the hotels into four categories, according to these prices for one night in a double room with shower/bath facilities: Deluxe ��300+; Expensive ��200-��300; Moderate ��100-��200; Budget up to ��100. Deluxe hotels usually offer air-conditioning, double-glazed windows, bar and restaurant (except in the smaller boutique hotels), and can arrange babysitting and airport shuttle service; in-room services often include modem connection and room service, plus other extras depending on the hotel. Expensive hotels offer similar amenities and services. The moderate hotels should have in-room phone, modem connection and breakfast service; at the budget hotels you can normally be assured of a TV and in-room phone. 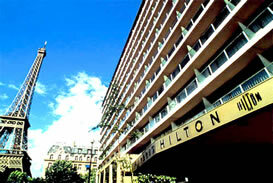 We provide a list of the key services below the description of each hotel. Note that all hotels in France charge an additional room tax (taxe de séjour) of around ��1 per person, sometimes included in the posted rate. Hotels are often booked solid during the major trade fairs (January, May, September), and it��s hard to find a quality pillow on which to lay your head during fashion weeks (January and early July for haute couture, March and October for prět-à-porter). However, at quieter times, including July and August, hotels often offer reasonable special deals at short notice; phone ahead or check their websites to find out. Same-day reservations can be made in person, for a small fee, at the Office de Tourisme de Paris.